Changing weather like the current winter storms, increased cold and flu symptoms and even the winter blues can keep the most dedicated blood donors from making or keeping an appointment to give blood. Yet winter weather can lead to more traumatic injuries on icy roads and may increase the need for blood. The local Red Cross needs about 650 blood donors every day to meet the needs of patients at 41 area hospitals. However, there has been a 10 percent dip in blood donations so far this winter. 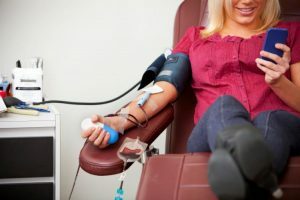 Recent blood drive cancellations due to weather also meant the Red Cross was not able to collect nearly 500 donations it had planned on for patients. And as the Red Cross is trying to recruit donors, a high number of people asked to give are reporting cold or flu symptoms, which make them not able to donate. The Red Cross and American Medical ID urge everyone to make donating blood a priority this winter. Your help could mean hope for those in need. To find out where you can give blood and to schedule your appointment, go to redcrossblood.org or call 1-800-RED CROSS, for additional information. awareness, National Blood Donor Month. Bookmark.